Making music is a great way for young people to demonstrate creativity. Playing a musical instrument teaches children how to manage information, solve problems, and work collaboratively. It is a good way to make friends and enjoy working towards a finished product. 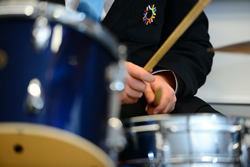 Instrumental lessons are delivered by a team of visiting professionals and Academy musicians each week. Tuition takes place on different days. Lessons last for 20 minutes and are at a different time each week to minimise disruption to other studies. Some lessons occur during break/lunchtime or before/after school. Any student interested in taking instrumental lessons should contact their student manager for an instrumental tuition letter. Lessons are available on the trumpet, trombone, tenor horn, euphonium and french horn. Lessons are available on the flute, clarinet and saxophone. Children who have spent time learning to play the recorder tend to find that progressing to a woodwind instrument is a natural transition. Lessons are available on the violin, viola double bass and cello. 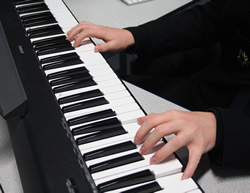 The piano/keyboard programme at The Wellington Academy trains students in either jazz, popular or classical methods of playing to ensure that they become versatile and informed performers. Lessons are available on both classical and electric guitar. Whichever instrument is preferred, students are encouraged to become familiar with a variety of methods of notation and master a breadth of playing techniques.